When you’ve got young children, keeping the house clean can seem like an impossible task. You end up fitting in household chores when you have a spare minute; focusing largely on the most-used rooms such as the kitchen and the living room. 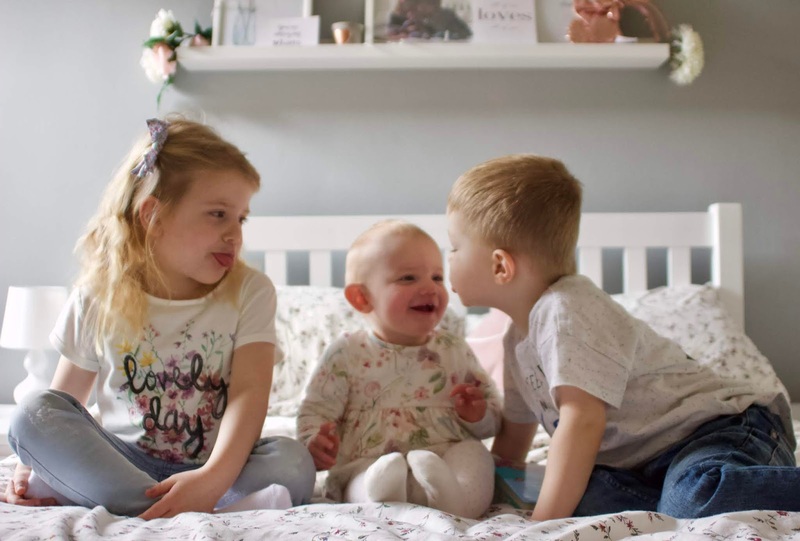 The nursery (especially if still unoccupied) tends to be one of the last rooms you think of cleaning, but did you know it can quickly become a potential danger if it isn’t kept clean and tidy? So today I am sharing some handy tips to help make your nursery a clean and comfortable space. Wash the curtains as well as the bedding - One thing that’s easy to forget about when you’re cleaning is the curtains. However they can easily develop a build-up of dust, debris and germs. So, it’s a good idea to wash the curtains just as regularly as you wash the bedding! This won’t just help to keep them clean, but it will also ensure they last longer too. When you’ve invested in a high-quality pair of curtains from a company such as Swift Direct Blinds, it makes sense to look after them to protect your investment. Clean the furniture once a week - It’s a good idea to clean all of the furniture in the nursery, including changing tables, the cot, and drawers. With changing tables, you’ll want to wipe the padded topper each time you’ve used it though of course. Depending upon which material it’s made from, you’ll also want to wash it once a week too. Cloth padding can easily be washed in the washing machine, but vinyl toppers should be hand cleaned with dishwasher liquid. Be sure to clean toys - Babies and toddlers may be cute, but they can also be full of germs. 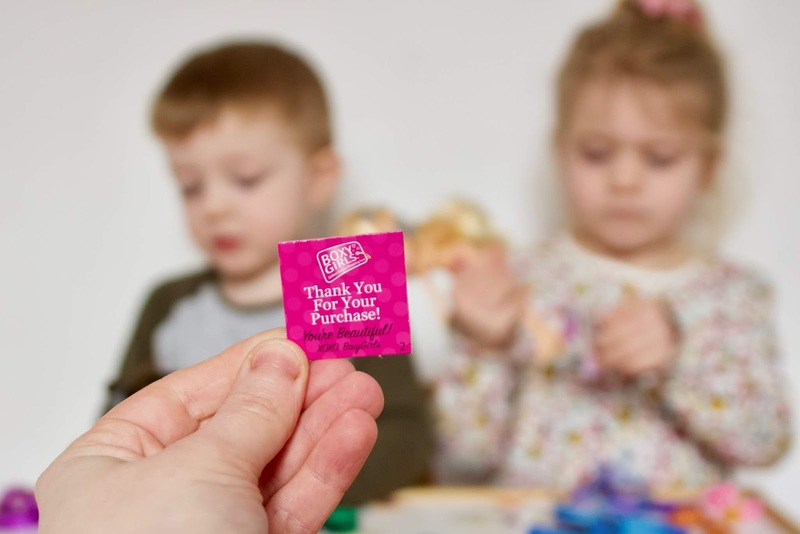 This means any toys they regularly play with are sure to contain a high level of bacteria. Cleaning the toys frequently, particularly when your little one is sick, will ensure germs are kept to a minimum. Consider investing in more machine-washable stuffed toys and plastic toys which can be easily soaked and wiped clean. Ideally, you’ll want to clean their toys once a week. Overall, keeping your child’s nursery clean does take a little effort, but it provides great peace of mind that it’s safe and hygienic for your little one. And the tips above will help you to ensure the nursery is clean and tidy with minimal effort. 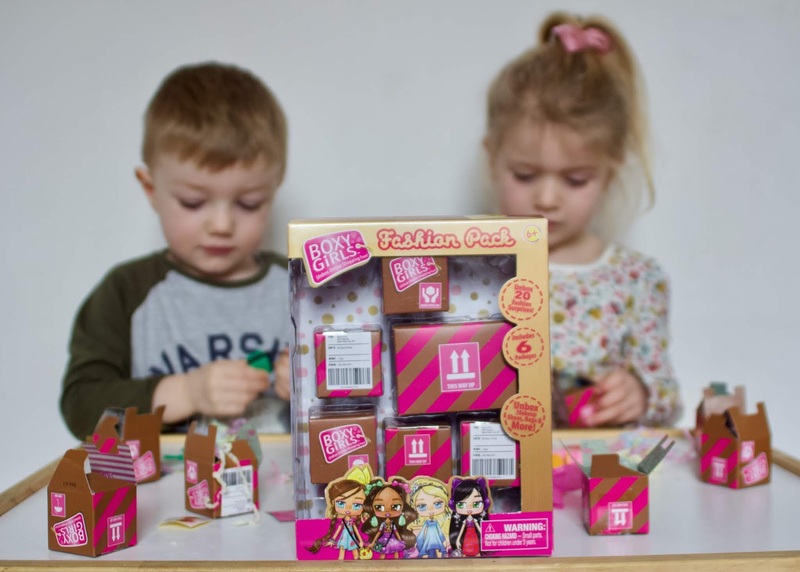 If you have a little girl (or even a little boy for that matter) then you'll no doubt be aware of the current 'unboxing' craze of toys at the moment. Both of my older two love nothing more than a surprise toy - especially as they come with the excitement of a brand new toy, and lots of secrets to unwrap and discover! 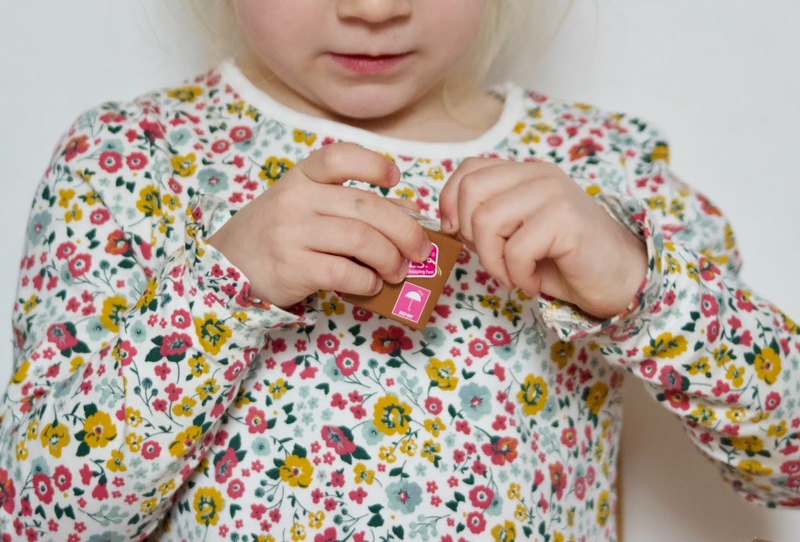 We were recently sent a package from Boxy Girls, which are a brand new fashion doll brand. 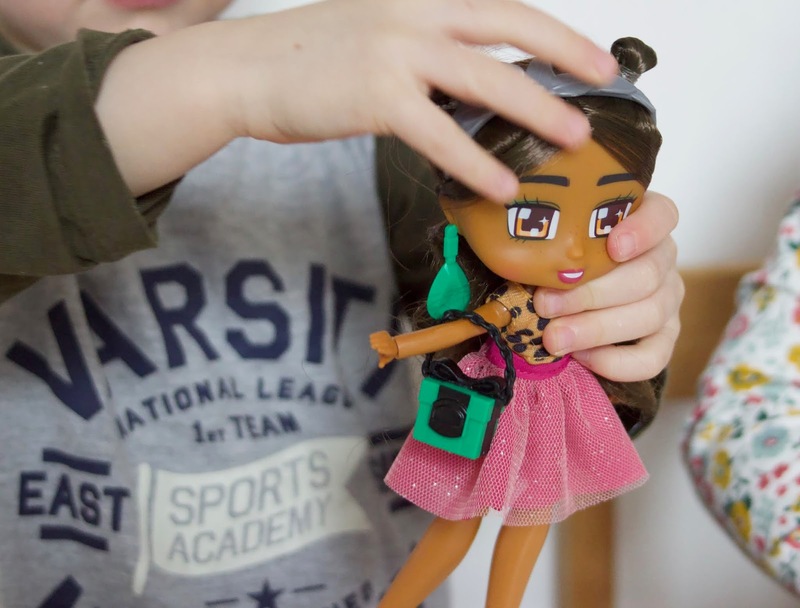 The Boxy Girls love shopping online, where they collect clothes, make-up, shoes and lots of other accessories. There are four different dolls (£17.99 each) to collect, and each come with 4 specially designed delivery packages to unwrap. 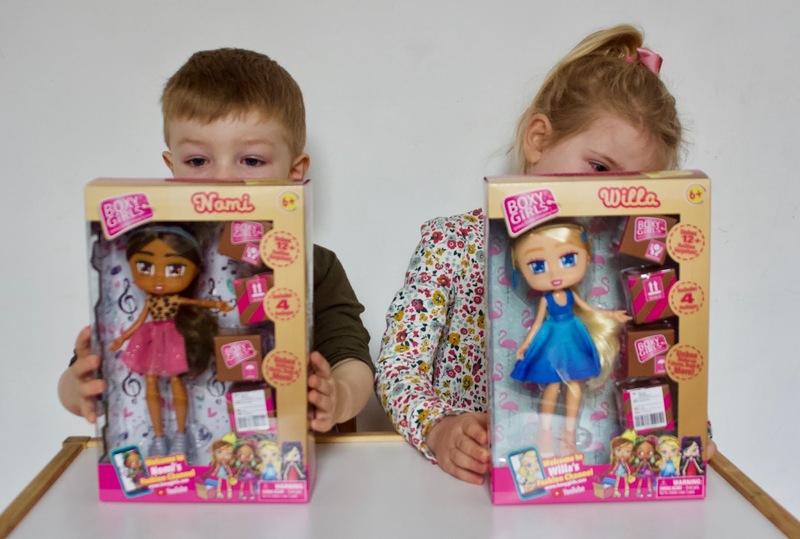 We received the Nomi and Willa dolls, as well as a Boxy Girls fashion pack - These are available to buy separately and include SIX delivery boxes full of luxury fashion surprises, including clothes, shoes, and makeup. As I expected, the surprise packages were the highlight of the Boxy Girls dolls. The cardboard box the dolls are packaged in even features an easy 'zip' opening, so they are easy to get into (although the dolls themselves will require scissors to remove). The Littles were far too excited by the packages to worry about anything else though, and they quickly started unwrapping and discovering what was inside. The packages are well designed, and really make you believe that they are from an online delivery. From the items themselves, to the added packaging material and little 'thank you for your purchase card', they really did think of everything! But saying that, as lovely as they are, once the 4 boxes were opened the dolls did kind of loose their surprise element, which is what the Littles seemed to enjoy most. And while you can buy the fashion packs separately, at £9.99 for 6 boxes I'm not sure this is something we could afford to buy regularly. The dolls themselves are lovely though, and the Littles have enjoyed role playing and using the accessories we received with them. 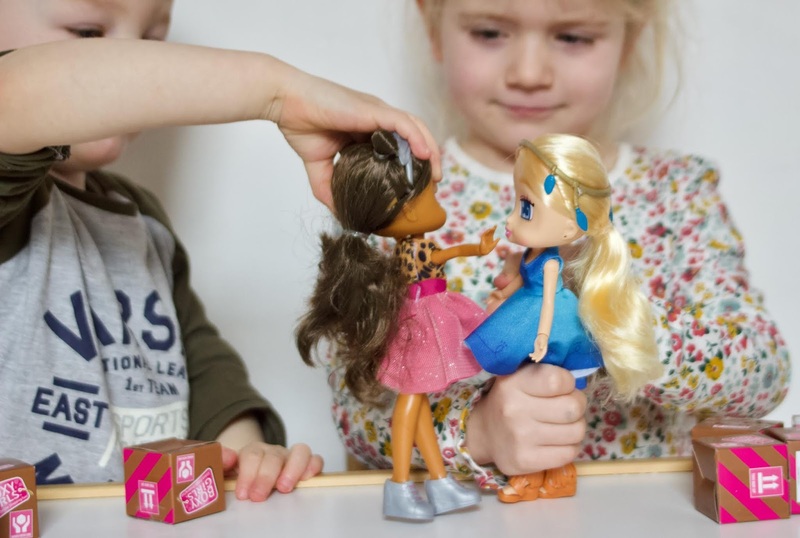 The dolls are fully jointed so are easy to pose, and most of the items mix and match giving you a few different options for your Boxy Girl Dolls (although we only received one outfit out of all of the boxes, so that was a bit of a shame). Season 2 is soon to be released though, so hopefully there is more chance of collecting different accessories then. 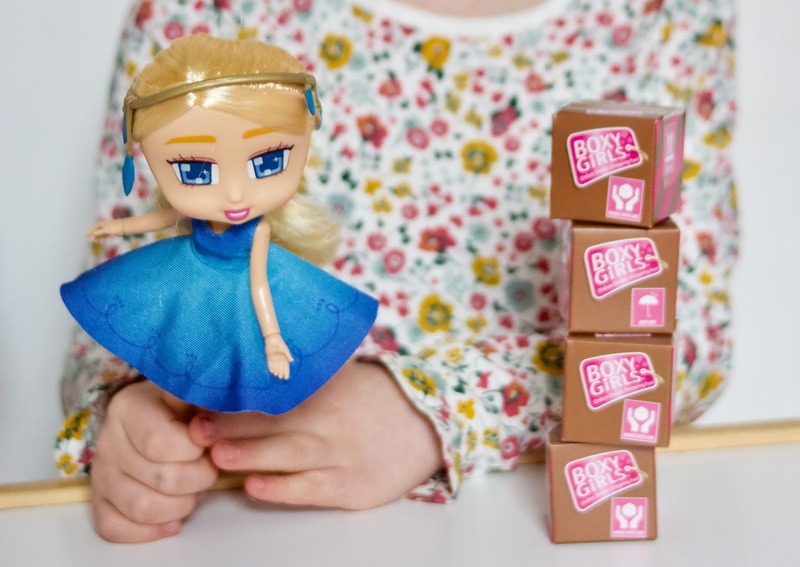 The Boxy Girls dolls are aimed at children aged 6+, and are available to buy from Amazon and all good retailers. You can also visit the Boxy Girls website, where your little ones can join Club Boxy Girls for news and more fun! We received these items in exchange for our review. All opinions are honest and my own. I had grand plans of taking pictures of my trio somewhere out and about this month. But with our weeks (and weekends) being so busy lately, I just didn't manage it. 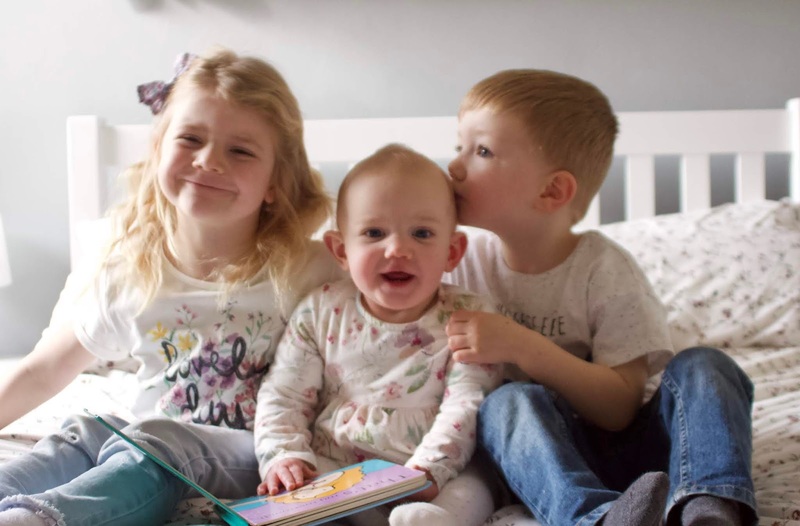 It's half term this time week though so with all three at home, I thought it was perfect timing to snap a few pictures of my little siblings crew. I took similar pictures last year when Lilah was just a few weeks old, so it's lovely to see how much she's grown already. From a teeny squishy newborn, to a proper little girl - with the sassiest attitude and cheeky personality to go with it! Half term has given my three a chance to regroup and enjoy some quality time together again. Despite being half way through the school year now, I still don't think Parker understands that Indie is at school every day. When he's at home with me, he's always asking when we can go and get her and why she has to go every day. Lilah on the other hand absolutely loves the peace and quiet on school and preschool days - she gets full reign of toys and has me all to herself (so I can read her every book we own over and over again..). But she does love when they're home, as they give her allll the cuddles and kisses! A lot of people hate the winter for how dark it can make our homes feel. For some though, this problem extends all year around! Brightening up your home can not only help it to feel cleaner, but it can also add a warmer vibe to your surroundings. So here are 5 tips to help you brighten up your home, and make it somewhere you can enjoy all year round. White is the most reflective colour, so by painting your walls this colour it will immediately make your home feel brighter. Colours like yellows and creams can also help to reflect light, so they could be a good alternative choice if you find white too clinical. It’s also possible to use glossy paints similar to these available from Dulux, as they will further help to reflect light. When it comes to the light in your home, you should also consider your furniture choices. Black leather sofas and dark wood cabinets may add to a darker feel, as well as giving the impression of a smaller space. Instead, try shopping for brighter choices of furniture from companies like Vida furniture. Consider light woods or white painted furniture when it comes to shelves and cabinets, and opt for a cream or light grey sofa, instead of dark leathers. Reflective surfaces such as mirrors can also help to brighten up your home. When it comes to small and poky rooms such as bathrooms, a large wall mirror can help to reflect light and make the room appear bigger. Smaller mirrors meanwhile can be placed opposite windows in order to create the illusion of more space. There are also other materials that can have similarly reflective properties too- stainless steel can produce a similar shine to a mirror, and laminated wood and polished stone also have strong reflective properties. Allowing more sunlight into your home will also help to make it brighter. 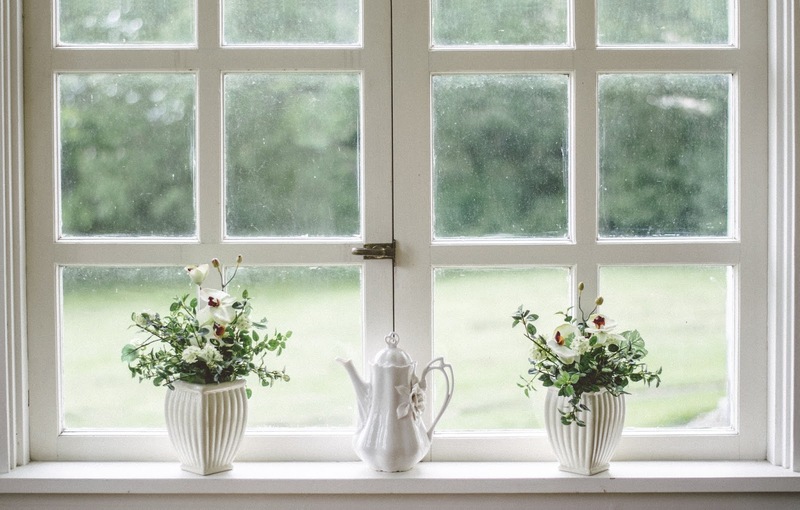 Make sure that none of your windows are obstructed by large ornaments, plants, or furniture. And of course curtains can minimise the amount of natural light coming through your windows too. If you like to close your curtains for privacy, you could always buy net curtains or blinds to still distort the view in whilst letting in light. On top of leaving windows unobstructed, you may wish to add in new windows or expand existing ones. For example Adding a skylight to a roof could help to let sunlight in from above. And if all else fails, you can always use artificial lighting to brighten your home. When it comes to overhead lighting, consider adding spotlights to corners of rooms or to recesses. Alternatively if you want to save money on electrical work, you could install track lighting instead. On top of overhead lighting, you can also use lamps to help brighten the room (lamps may use up less electricity, saving you money on your energy bills too). As soon as the littles are home from school, we're quickly thrown into the chaos of reading books, crafts and trying to get the baby to nap. So finding the time to make healthy and tasty meals for the family usually gets thrown to the bottom of the priority list. Therefore when Gousto got in touch and asked if I wanted to try out on of their food boxes, I of course said yes! 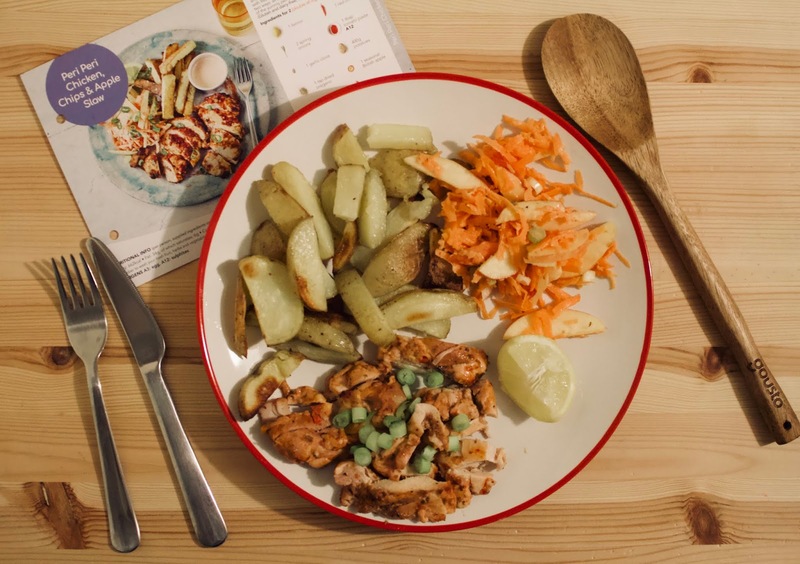 Gousto is a food box subscription service, that makes it easy (and hopefully enjoyable) for you to create healthy home-cooked meals from scratch. They have a large variety of over 20 meals to choose from - that you simply pick, order, and they then deliver to your door. Their menus changes weekly too, meaning that there's always something new to discover and enjoy! There are lots of different types of recipes to pick from, making it easy to find meals that will suit a large range of households. The different collections include speedy meals (these take 10 minutes or less! ), vegetarian or plant-based meals, gluten and dairy-free meals, world food, and of course family friendly meals (which contain less spice and chillis). The ingredients for your chosen recipes. All the spices and condiments arrive in a brown paper bag, and chilled products come in a biodegradable Woolcool bag with ice packs. Recipe cards with easy-to-follow instructions (and a full ingredients list). Any extras that you purchased from the Gousto Market. And sometimes Gousto even add a little free treat - we received a wooden spoon with our order! And if this your first box you will also get a Welcome Booklet. Ordering our box was really simple. I was asked a few questions to create our first box, to find out how many we wanted to order for (2 or 4 people), and where delivery was. I then picked the meals we wanted to receive, selected checkout and our box was ordered! We went for the Peri Peri Chicken, Chips & Apple Slaw, Cottage Pie & Broccoli and the Joe Wicks Cheeky Chicken Tikka. I was given a selection of dates to choose from for delivery (they deliver 7 days a week), and was told this was between 8am - 7pm. Thankfully on the day I was given a smaller time slot from my Yodel delivery driver, but as delivery is free I wasn't too annoyed about the long delivery slot. Some parts of the UK do offer morning or evening deliveries for an extra £2.99 too. Just having our Gousto box arrived created excitement in the house. The littles were SO excited to unpack everything and see all of the ingredients - they wanted to touch and smell everything, which I think just got them even more excited for the meals ahead. Unfortunately though for Parker (aged 3) that's where the excitement ended, as he didn't actually eat any of the meals... whoops! Jack and I however, really enjoyed preparing and making the recipes we ordered. The recipe cards gave clear instructions, and I loved that each step included pictures as this really helps me with recipes. The fact that the Gousto box provides the exact quantity of ingredients needed (especially spices! ), made cooking the meal soo much easier and quicker too. Which is especially important as a busy mum of three! Taste-wise I was incredibly impressed with the recipes we received. 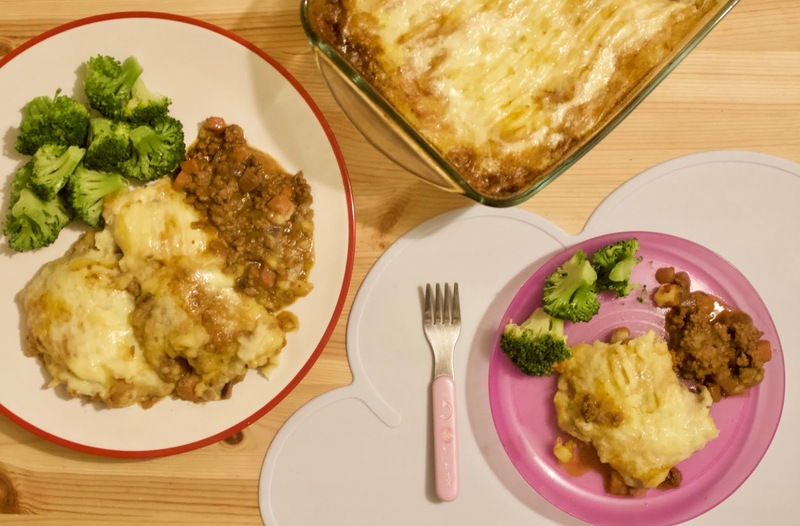 As a family of 5 it is tricky to find meals that all of us will enjoy - especially as our little ones are aged 12 months, 3 and 5. But apart from Parker (who is fussy regardless), we all cleared our plates. I must also say that from each meal we managed to feed 2 adults, 3 children and have leftovers - so the portion sizes are great! Gousto state that they are 'committed to creating meaningful long-term relationships with trusted farmers, producers and suppliers who care about quality and sustainability as much as we do, and who share our values'. I could really tell the ingredients we received were of high quality, especially in regards to the meat. And I was just so pleased that we were eating healthy, fresh and tasty meals; made possible by our Gousto box. The down-side of Gousto though? The price. We budget roughly £60 a week for our food shop - and that includes everything; not just evening meals. A Gousto box for 4 people, with only 4 evening meals costs around £50 alone. As we know from trying the meals, they are healthy, tasty and do make meal planning a whole lot easier. But for us, we just couldn't justify spending that each week, as well as spending out on the rest of the food and household items we need. 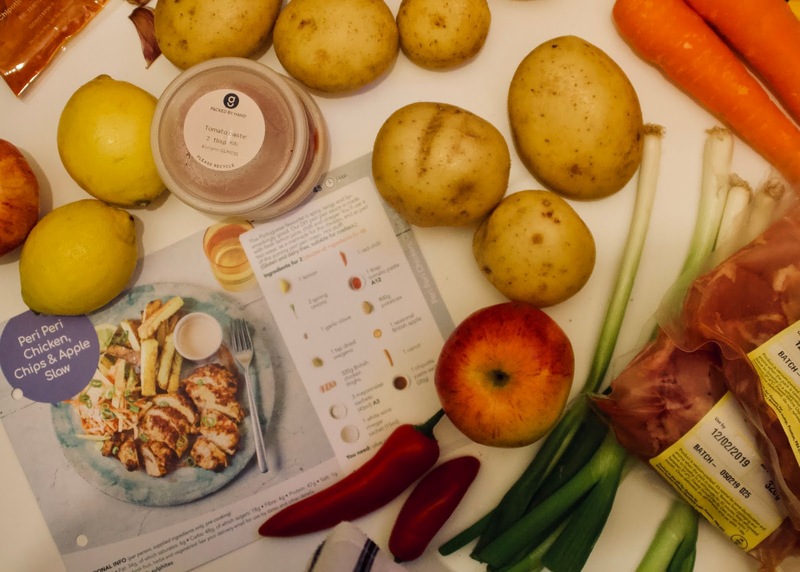 However saying that, Gousto are cheaper than a well known competitor, and the boxes would be perfect to order on a particularly busy week, if you want to make meal planning easier. 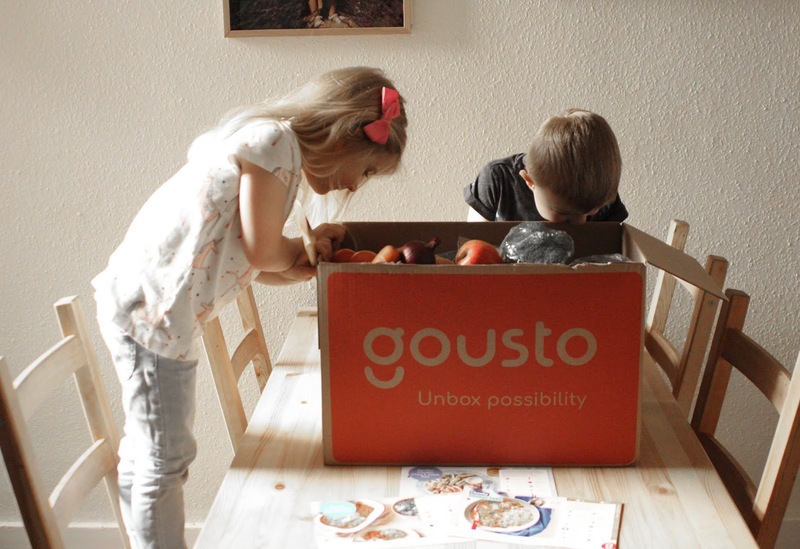 Gousto allow you to turn your subscription on and off whenever you wish, so with that knowledge we will definitely be coming back to Gousto when we need to! 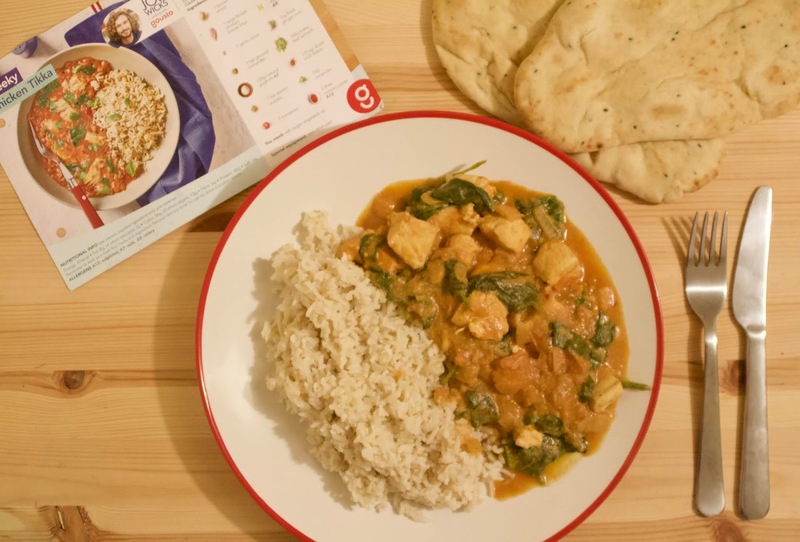 Fancy trying out Gousto for yourself? Then I have a special code that you can use to give you 60% off of your 1st box, and then 30% off any other orders in the first month of signing up. Just enter EMILYP60M at the checkout - and make sure to share your recipes with me if you do sign up! This is a sponsored collaboration with Gousto. However all opinions are honest and my own. Your wedding day will always be the biggest, and most lavish day of your life. It is a day which you will always want to be perfect in every way, so planning every detail of your wedding day can take a lot of time and work. 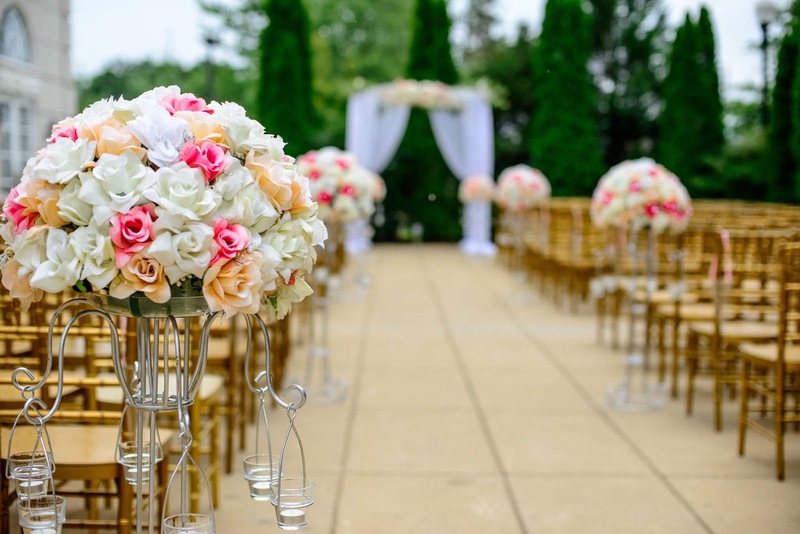 In this post we are going to take a look at perhaps the most difficult wedding planning decisions of all - choosing the ideal wedding venues for your celebration. And I am going to take a look into some simple tips and tricks you can use, to help you pick the right place this year. The easiest step you can take if you are unsure of what to do in terms of your wedding venue, is to ask a wedding planner for advice. They will be able to help you pick out one which will suit your needs for the day, and pick somewhere that suits your budget. They will likely have a whole list of venues who they are in contact with every day too, so this will make things a lot easier for you when you want to narrow down your search to find the ideal place. To pick the best venue for you, you need to think of what YOU want in a venue. If you want to have a lavish and a luxurious affair, it might be a good idea to opt for a large cathedral or a castle. 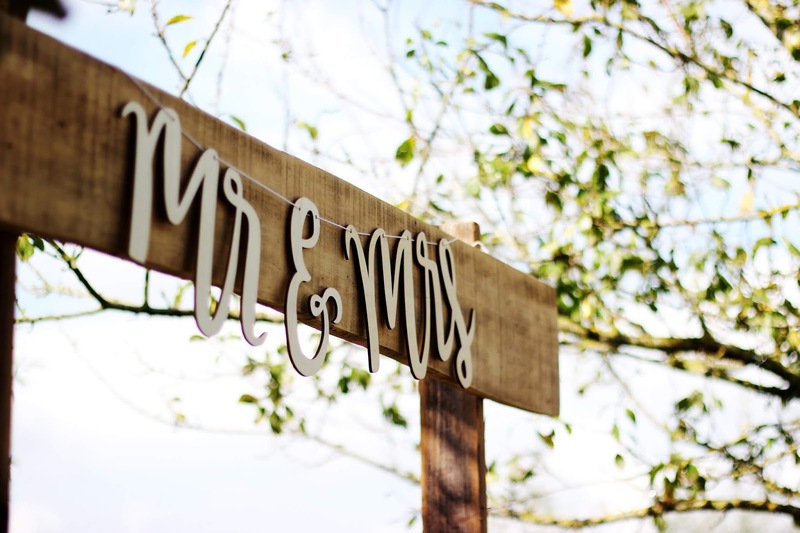 However if you want to have something a little more quaint and cute, you could choose to have an outdoor wedding or choose a little country pub or hotel for the day. The kind of venue you choose will have a massive impact on the theme of your day, and this is why it is so important for you to choose the right one for you. There is a huge difference in needs, for a wedding who will have 50 guests, and one which will have 150. Before you can truly choose a venue which reflects what you want, you need to create a solid guest list so that you know how many people you need to cater for (and make space for in the evening). If you have a small party there is no sense in booking a huge function room, so perhaps a village hall or country pub would suit you better. If you have a large guest list however, you need to make sure you have room for everyone, so large hotel function room or a room in a stately home would be better suited. The location of your wedding is a crucial factor in the planning process of your big day. You will need to decide how you will travel to the venue, and also factor in how far away it is for your guests too. It is a good idea to try and choose somewhere which is within an hour or so away from your home, as this will make things easier for everyone who attends. If you do pick somewhere a little further away, make sure to discuss booking rooms with your chosen location though. Before you pick any wedding venue, you need to have an in-depth discussion about your budget. A strict budget will make it a lot easier for you to narrow down your search options, and it will also ensure that you don’t get your hopes up too high. You need to make sure you have availability to some of this budget too, as most venues require a deposit when booking. And finally, make sure you enquire about what is included in your package when you book a venue. A lot of venues will have a few different packages to choose from, and these will include things such as the room hire, DJ, food, an evening buffet and maybe even a room for the wedding night! Make sure when you are looking for venues that you get the best possible deal and that it fits in with your needs and budget. When you’re running a busy family home, it can be difficult to keep things continuously tidy and organised. Juggling work, family life and chores can prove to be an almost impossible task! However, there are some ways to make the home run a little smoother, regardless of how busy it becomes. Here, you’ll discover some great tips to help make your house work as a busy family home. A great place to start is the entrance to the home. This is where shoes, coats and accessories often get stored (or more likely, thrown into a pile!). No matter how many times you tell them, you can guarantee your children won’t ever hang their coats on hangers. So the key is to create a personalised storage system that works for everyone. Use tubs to store shoes or consider adding drawers which can keep shoes stored out of sight. You can also use a tub to keep your keys in and add a large vase by the door to store umbrellas. If the entrance is kept clean and tidy, it’s going to make the rest of the home feel more organised too. When you have kids, it’s near enough impossible to keep furniture clean and unmarked. Sofas are particularly easy to get marked, either by sticky fingers or spilt drinks - so it’s never going to look clean. Take advantage of the cover up technique to help. You can use a throw to hide stains on the sofa, and a rug to cover up stains on a floor. Just make sure you don't let these become too untidy too though! Your furniture can take up a lot of space, so in a busy family home, this means the furniture can easily become a tripping and bumping hazard. It’s a good idea to try and focus on investing in hide-away furniture wherever possible. Switching from chairs to stools in the kitchen is a great way to save space. Stools take up naturally less room than chairs, plus they can also be stacked for better storage too. Or why not try a fold-away table - it will save space but still be a practical play to eat and do homework. Finally, baskets can prove to be your best friend when you’re trying to keep a busy family home clean and organised. They can be used to store toys, magazines, remotes, toilet roll and even cleaning products. They’re available in a lot of different sizes and can look really stylish if you want to keep your home looking more 'grown up'. These are just some of the great ways to make your house work as a busy family home. By investing in the right storage, you can easily keep the home clean and organised. Let me know your best tips below! Well, didn't January feel like the longest month ever? Christmas and New Year seem like a lifetime a go now, but they were really only a few weeks ago... mad isn't it! And I must admit, apart from celebrating Lilah's first birthday on the 14th, I wasn't a huge fan of the last month at all. We had snow, lots of rain, and the temperatures reallllly dropped last month. This then combined with overtired children and Indie having so many birthday parties to attend (the lucky thing), we really didn't get out as much as we would have liked. 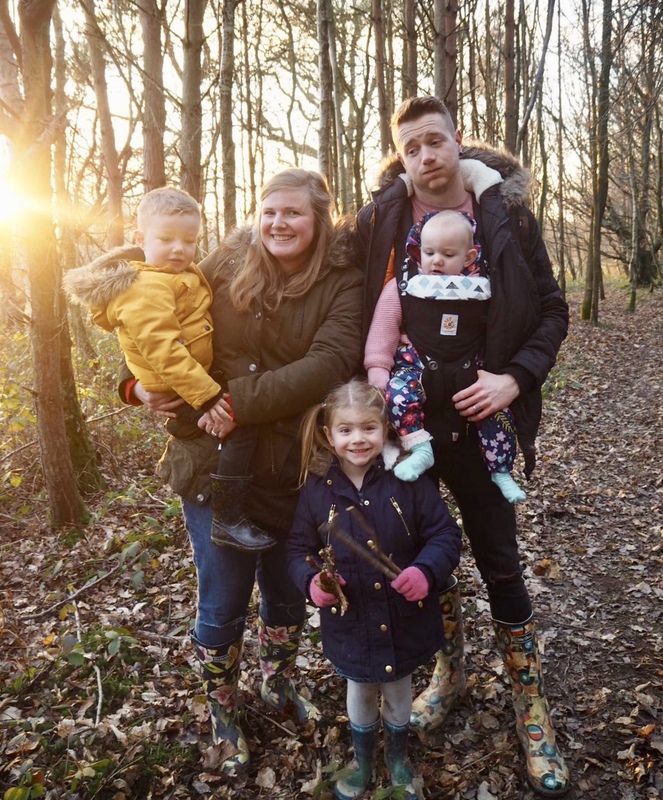 We spent so much more time at home then usual, and I think this is why I wasn't quite feeling January this year - we are definitely so much happier when out and about exploring! This month's Me and Mine pictures were taken by our lovely friend Harriet, during a little catch up a few weeks ago. 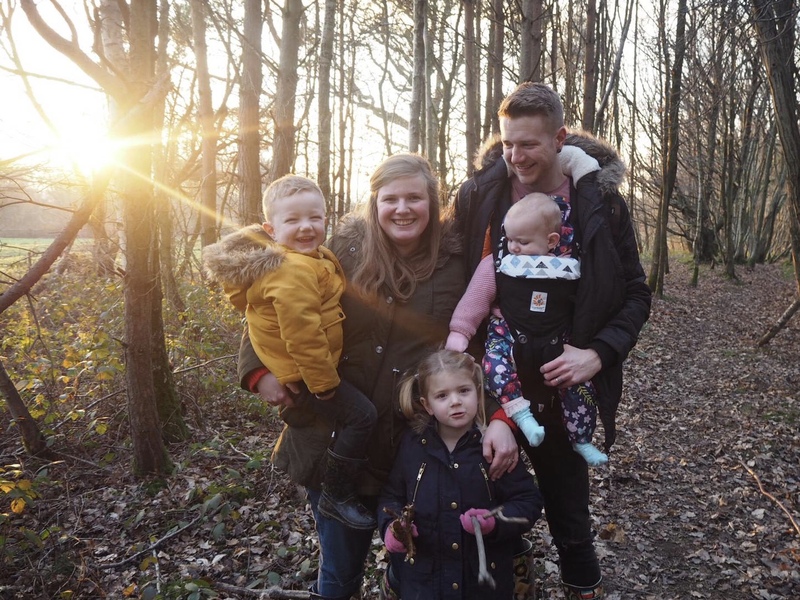 The lighting was so beautiful we just had to grab a quick photo; and although it's definitely getting tricker to get these monthly family portraits (Jack's face in the second picture pretty much sums it up), I am so excited to be joining in with Me and Mine for another year! Toddlers are always on the go, and need almost constant entertainment. There's so many simple and cheap activities you can do though to keep them busy, and having fun. Jack works in a nursery so is full of great ideas, and his most recent was to create a treasure map and go on an adventure! It was a huge hit with our two year old Indiana, and both of us and her 1 year old brother loved it too. The map was SO simple to make. Most people have paper laying around and tea bags in the cupboard, making it completely free too. Just pour / dab the paper with tea (or coffee) and leave to dry. Scrunch up the paper to give it a really old look - you could tear or burn the edges to add extra effect if you want too! Once the paper is dry simply add on things / places to spot, and make sure you don't forget the all important 'X' marks the spot! We chose to do our hunt at our local National Trust property Knole Park, so added things such as the house, deer and the golf course for Indiana to find. Once finished we rolled it up and tied it with string to complete the look. The second we arrived Indiana wanted to begin the adventure. We unrolled the map and she was off! We found everything on the map with Indie leading the way. She loved pointing out the pictures on the map and then discovering them in real life. The deer were probably her favourite, and she wasn't shy in going to show them her map. Of course Parker is still a bit too little at 12 months, but he loved playing with the map too. Although with Indiana by his side pointing things out, I'm sure it won't be long before he's off finding the treasure with her! We didn't keep the activity going too long as, 2 year olds don't have the longest attention span - the good thing about this is you can the activity as long or short as possible! I sneaked off ahead and placed the 'treasure' is an easy to reach and see spot (I say easy, but it took her about 5 minutes to find it, even when it was right in front of her haha). We just used a medal we already had and some little sweets, but you could use anything you have laying around - if you're feeling creative you could even make a treasure chest to hide the treasure in! Indie was thrilled with her prizes though and proudly wore her medal for the rest of the day. We did so much walking and exploring during the hunt - much more than Indie would usually do as she can get quite lazy. So if you have a toddler and want a fun, cheap and easy activity to do. 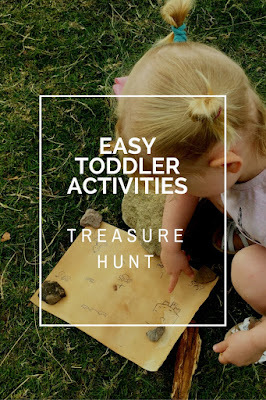 Make a treasure map and go on an adventure! 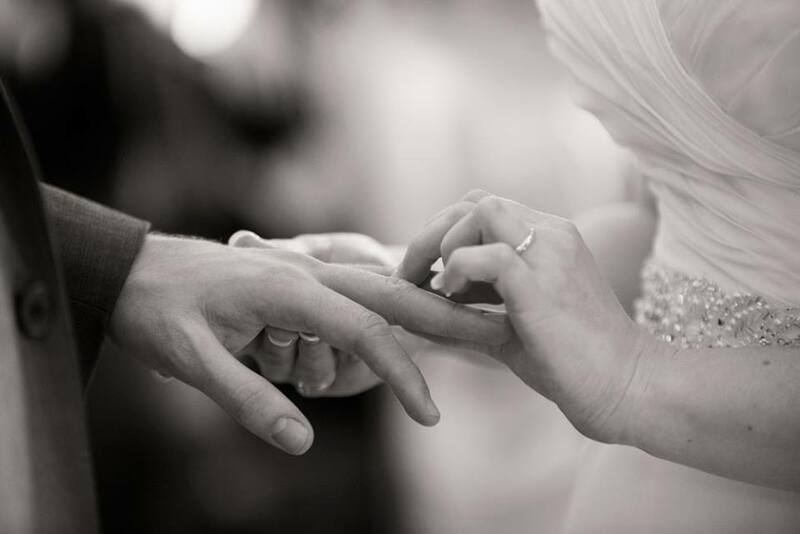 Your wedding and engagement rings are a symbol of the undying love between you and your partner. They’re also most likely to be extremely valuable. Therefore, it’s important to make sure you take the time to really look after them! Without maintenance, rings can start to really lose their sparkle, and even potentially become damaged. So if you’re looking to protect your wedding and engagement rings, below you’ll discover some of the best ways to look after them. While you obviously don’t want to think about losing your rings or having them stolen, it can happen. Therefore, it’s important to protect yourself with insurance. This will cover the cost of the rings if they do get lost, damaged or stolen, ensuring you can replace or repair them quickly. It’s worth noting that rings should be appraised every five years too. This is because the cost of precious metals and diamonds tends to rise over time. So, your rings may well be worth more now than they were five years ago! As your wedding and engagement rings are so valuable, it’s common to not want to take them off at all. However, if you want to ensure they remain in great condition, you’re going to need to remove them in certain situations. Some common times to make sure you remove your ring include when you’re washing up, doing the laundry, and working out. Even if the rings fit snugly and there’s no chance they could fall off, they can still become damaged and the band of the ring could stretch due to the pressure. So it’s much safer to take your rings off while you perform these types of activities. To keep your rings in top condition, it’s also important to clean them regularly with a specialist cleaner. Twice a year you will also want to thoroughly clean and inspect them; you’ll be able to pick up on any minor damage which needs to be repaired. Taking care of damage while it is still minor will prevent larger and more expensive repair jobs further down the line. Finally, it’s important not to have your rings resized more than once. This is because it weakens the band and poses a risk of damage; particularly on delicate engagement rings. If your fingers have swollen after pregnancy for example, wait a few months after giving birth and you should notice your fingers are back to how they were before the pregnancy. These are just some of the tips to ensure you take care of your wedding and engagement rings properly. Remember, the more care and maintenance you give them, the longer they’re going to last! When it comes to your home, you’re always going to be spending time trying to get it all together. Because we all want to live in a house that we love don't we? Yet, it’s not always easy to know what you should do to keep things looking great - nor are you always that inspired. So it’s common to find that your house doesn’t overly look the way that you want it to. If this is the case, you might want to start thinking outside the box and shaking up your interiors - especially with summer just around the corner now. To really reap the benefits of a bright and breezy home, then adding in a conservatory or orangery can help! The idea here is to give yourself more space and more light. Of course some people can be against them (complaining that they’re too hot in the summer and too cold in the winter), but there are ways to work around that. Because when you get a sanctuary of a space with lots of light, it’s often worth while! When it comes to getting the project underway, you’ll want to decide on the design. Do you want to go with a conservatory or more of an orangery design? Think about what kind of shape and space you want to work with, then also the sort of colour schemes that you want to go with here too. You’ll want to think about finding the best companies to work with, and also a cost that you’re happy with (and can realistically afford!) too. A conservatory can be half the price, if not more, of an orangery, so keep that in mind. Then work out what kind of build and company will be best for your budget. Next, you’re going to want to think about the finishing touches that you want to go with here. You’ll choose the design and the actual structural finishes when you’re going through the initial process, but there are extras to consider too. Have a think about shutters or fly screens (or both), as these can protect the space and also add to the design. Don't forget to go furniture shopping too, as this will really complete the room! Selling your home can be a very long process, and it can be frustrating to have to make sure that everything is perfect every time you show potential buyers around. But it’s all about highlighting the good things about the house and downplaying the bad things - as this can instantly put buyers off. Space is one of the things that buyers are always looking for, so you need to make sure that the house looks open and airy. This is of course fine if you’ve got a big house, but what do you do if you’ve got a small house? 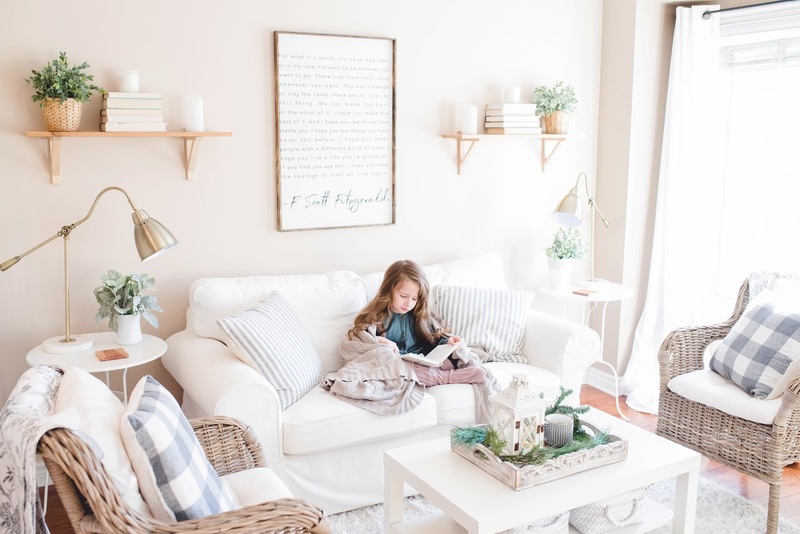 You just need to use some clever staging tricks when you show the house, and below I've shared 4 tips to help with this! Before you start looking at ways to maximise the space in your small home, it’s important that you remember to be patient. It’s true that there are ways to sell your home fast, but they might not necessarily work for you. You might not get as much interest in your small home, so don’t be disheartened if it doesn’t sell right away. Just be patient and eventually, you’ll find a buyer that falls in love with the place. The more stuff that you’ve got packed into a room, the smaller it’s going to look. And if you have a lot of large pieces of furniture in every room, the house is going to feel extra cramped. Before you start showing people around, you could move some furniture out, and put in into storage for a while instead. You should also consider the visual weight of the furniture that you’re keeping - try to go for slimline furniture that doesn’t block the flow of light in the room. When you’re trying to create the illusion of space, it’s all about the line of sight. When you’ve got doors on every room, people can only see the immediate space around them and, in a small room, that will feel quite claustrophobic. But if you take the doors off (so you can see right through the property) it will feel a lot larger. It's probably best to keep doors on bedrooms and bathrooms though of course! Painting the whole house in a single colour might seem a bit boring, however it really works in a small home. If you paint every room in different colours, it sets clear boundaries between them. When somebody is passing through the house, they will see lots of separate, small spaces instead of one larger whole. But if you paint all of the rooms in a single colour, you bring those spaces together and make the house seem larger than it is. White walls help brighten small spaces too. Selling a small home can be tough, but if you use these simple staging tricks, the offers will start rolling in. Good luck!